It was 11 March 2003. Though I was startled by this man’s bile, it wasn’t a complete surprise. Back home powerful people had been preparing for over a year to wreak havoc in Iraq. Very soon they would get on with it. 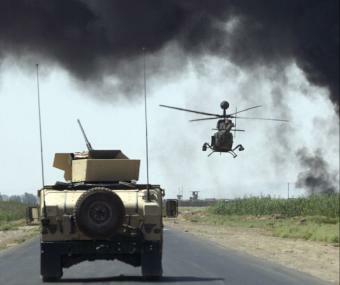 In fact, the killing had already started–American and British air strikes had been “softening up” Iraq for a couple of weeks–though the brunt of the massive US-led assault would begin nine days later, on 20 March. I didn’t like it, either. Though I knew better than to engage a drunk, I made a foolish and feeble attempt. I was unhappy about the situation myself, I tried to explain, before the man’s partner said “Sorry, mate” and pulled him away. Louise led me in the other direction, properly berating me for my poor judgment. Better to focus ahead–we would spend tomorrow on the Otago Peninsula, tramping down to the beach, watching royal albatross and yellow-eyed penguins and touring Larnach Castle. Sure enough, 12 March 2003 was glorious. Another wonderful day, 3½ weeks into a four-week tour. That month there was the constant joy of discovery. Underneath it, though, lay the shocking, deadly madness of the impending war. The duality mirrored and gave rise to our dual purpose: we were touring as well as looking for a new home. In the States we’d studied New Zealand maps and guidebooks, talked to the New Zealand consulate, watched New Zealand movies that had reached the States: Utu, The Piano, Whale Rider, Lord of the Rings. Not much of an education, but we knew at least this: New Zealand was far away; it was a beautiful English-speaking country; and, most impressive, the New Zealand government and people had thus far resisted enormous pressure from the world’s most powerful country to participate in the upcoming carnage. It was time to learn more. So we paid close attention from the moment we stepped off the “Gateway to Middle Earth” into the warm, moist air of a late summer Auckland dawn on Monday, 17 February. First impression: boats. Enormous, flash, extravagantly beautiful yachts–an opulent display of nautical mad money berthed along Viaduct Basin. It was the America’s Cup. Team New Zealand NZL 82 had lost the first two races to Alinghi SUI 64 but the general mood was still reasonably good. There was unease, but it was not grim. Not yet. Auckland was lively that weekend. Not long before we arrived, we learned, 8000-10,000 people had marched down Queen St in concert with 6-10 million worldwide against the upcoming war. The next day my most immediate concern was more mundane: how to drive on the left side of the road through downtown Auckland, onto the motorway and all the way to Rotorua without injuring anyone or damaging the car. She’ll Be Right Auto Rental (not their real name but it might as well have been) had checked my licence, taken our $NZ and turned us loose with not a word of instruction. They could have at least told us about the left-turning-traffic-give-way-to-oncoming right-turning traffic rule. Who knew? Not us. Tuesday, 18 February—Rotorua. Rotorua was our first exposure to tikanga Māori. It immediately made a lasting impression, especially the drama of the karanga and the wero (challenge) and the dazzling audacity and passion of kapa haka. The next day there was another Kiwi challenge 14,000 kilometres to the northeast in New York City. 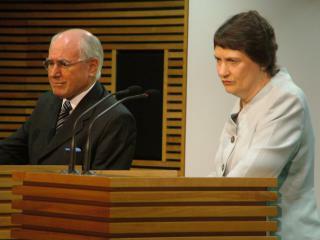 New Zealand and a group of 32 other countries challenged the United States and United Kingdom to respect international law. In New York, at an open UN Security Council meeting, New Zealand’s ambassador to the UN Don MacKay affirmed that (as phrased in the Security Council press release) “New Zealand did not support military action against Iraq without a mandate from the Security Council, and did not believe the Council would be justified in giving such a mandate at the current time.” Mr MacKay was well and faithfully representing his country. The day before, the New Zealand Herald reported a Colmar Brunton poll that asked: “Do you personally believe that the United States has presented sufficient evidence that Iraq possesses weapons of mass destruction to justify a US-led war in Iraq?” 71% said no, 19% said yes and 10% didn’t know. Back in the Hauraki Gulf: more drama, increasing gloom: Team New Zealand was beaten by 23 seconds in race # 3. In a blog from the time, “Possump” wrote: “Much slashing of wrists. Supplies of blades and knives at a premium…Pretty dire situation but there are still races to go. I need a cup of tea and a lie down”. Saturday-Sunday 22-23 February—Wellington. A headline in the Business Section of that weekend’s Dominion Post read: “Kiwi hits a new high against US.” The story began: “The New Zealand dollar is at levels not seen for nearly four years against the United States dollar. The Kiwi closed at US55.96c yesterday, its highest since May 1999…” We rode the cable car and wandered along the waterfront and through Te Papa. One thing was quickly clear: in this beautiful and compact city we were much better off on foot than in a car. 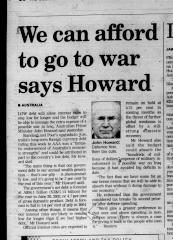 Australian Prime Minister John Howard was willing to spill blood in a country that was not threatening the United States, much less Australia. That day he was offering the bloodless perspective of an accountant. Two nights in Nelson were sandwiched around a day floating in a kayak above golden sand in the crystal water of Abel Tasman. Our guide apologised–the water wasn’t as clear as usual, since there’d been some wind recently that had stirred things up a bit. I was beginning to get the idea that Kiwis apologise a lot. Talking with this self-effacing gentleman in the ute on the way back to Nelson, the subject of the war came up. I used the word “arrogance”. The man, looking down at the floor, softly said, “That’s it, isn’t it? Arrogance”. Wednesday 26 February–West Coast. As we drove down the West Coast, the locals seemed no happier with the war than did the rest of New Zealand. The Greymouth Evening Star 19 March editorial read: “By serving his 48-hour ultimatum on Saddam and his sons President Bush effectively spelled out the death of the United Nations as we have known it for more than half a century.” The day after, in an article in the 20 March Westport News, Buller Mayor Pat O’Dea’s language was more colourful: “[T]he conflict should be between the politicians and the leaders. They should stand up and face each other at 10 paces and shoot each other. Dropping bombs on men, women and children is not my idea of fair play or human decency”. On Thursday 27 February we crunched around Fox Glacier in crampons. On the same day, half a world away in Westminster, 198 MPs (including 121 Labour MPs) voted against Labour Prime Minister Tony Blair’s war strategy. The Guardian described the scale of the revolt as “the biggest within a governing party for more than a century”. One senior minister said, “Tony now knows he has to go along the UN route…” The senior minister had it wrong. Friday 28 February was the day of the Collapse. Not the collapse of the peace process, though that was clearly imminent. Nor was there a collapse in New Zealand’s determination to abide by international law. Far more dismaying to a host of New Zealanders was the Collapse of the Mast. At 57 minutes into the fourth race, NZL 82 plunged into two large waves in succession. The mast snapped, collapsed, and the race was over. Saturday, 1 March was mostly spent preparing, in Queenstown, for the four-night Milford Track walk. The next afternoon, Sunday 2 March, we were part of group of 44 that boarded the bus for Te Anau. There were Asians (mostly Japanese), Australians, Brits, Canadians, Americans and Kiwis. At six, we Yanks comprised one of the smaller nationality groups. The smallest group consisted of three Kiwis. They were the youngest, strongest and clearly most fit of the lot. This was good–they were the guides. For four nights we were 100% out of touch with the rest of the world. Our last bit of news before beginning our tramp up the Clinton River Valley was what by then seemed inevitable: Team New Zealand had sailed and lost the final race of the America’s Cup. We’d read about the Milford Track in books, seen the photos and heard people speak in near-reverent tones about the world-class vistas. We would have to take their word for it. Instead of gazing at miles of still-life sunlit bush and river valley, we were immersed (almost literally) in a dynamic, flowing, thundering display of what happens in a steep, undisturbed canyon in a rain forest when it rains. As the rain picked up and turned into a deluge, dozens of enormous cataracts appeared, plummeting out of the cliff walls and into the roaring Clinton and Arthur Rivers. As the rain lightened or stopped, they would slow–some to a trickle. Some even disappeared. It wasn’t much of a photo-op. What we could see was usually a hundred shades of moving grey, obscuring and then revealing silver and black waterfalls and cliffs. More than light, it was movement, sound, smell and chill. This may have been the only time in my life I’ve been cold, wet and happy. For the time being we were in another universe. We retreated again–this time on Friday, 7 March–for a long weekend on Stewart Island. Retreat was in order: earlier that day, President Bush had given a rare prime-time television address indicating war was very close: “It’s now time for this issue to come to a head at the Security Council, and it will…Saddam Hussein and his weapons are a direct threat to this country, to our people and to all free people.”We enjoyed the peace and beauty of Stewart Island those three nights. It was literally the farthest we were going to get from the approaching American-made nightmare. Wednesday, 12 March. While we were touring the peninsula on our second day in Otago, US Defence Secretary Donald Rumsfeld wasn’t making things any easier for Yanks touring an anti-war country. The Guardian reported Mr Rumsfeld’s assertion that, because of UK Prime Minister Tony Blair’s “internal political problems”, the US was contemplating going to war alone. That day, the Otago Daily Times published its “Letter of the Month”. In the letter, Mr Charles Pigden of Burkes compared US National Security Advisor Dr Condoleezza Rice to a “she-ogre”, urging her to withdraw the threat of an American attack on Iraq. “That way”, he wrote, “people might stop thinking of her and her government as a collection of ogres”. I decided not to write a letter in reply, identifying myself as an American and saying I was as unhappy about it as Mr Pigden. That evening in our rental car, “She’ll Be Right” caught up with us. In my ignorance, I made a left turn, asserting a right-of-way in front of an oncoming right-turner. The driver was, to use an Americanism, seriously pissed. His horn blared loud and long at us clueless scofflaws. We were baffled. Though we thoroughly enjoyed Dunedin, we had inadvertently managed to enrage at least two locals. The next morning, without further insult or injury (that I’m aware of), we continued north for our last stop–Christchurch. The next day, Saturday 15 March, we flew home to California. The war was coming–our government was responsible, and we were sick at heart. Sunday 16 March. We picked up our dog at Louise’s sister’s house. 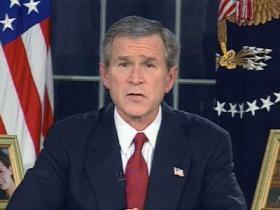 The family was deeply split politically and the in-laws were aware of New Zealand’s stance on war with Iraq. Conversation was superficial. There was little doubt, though, that these rellies approved of the ultimatum to the world President Bush delivered that day from a press conference in the Azores: “[T]omorrow is a moment of truth for the world. Many nations have voiced a commitment to peace and security. And now they must demonstrate that commitment to peace and security in the only effective way, by supporting the immediate and unconditional disarmament of Saddam Hussein. In other words, the “only effective way” to demonstrate the commitment to peace and security was to start a war. 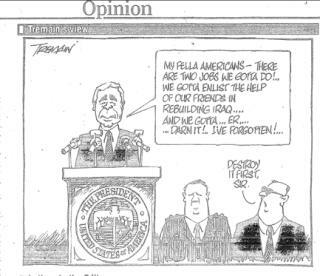 Back in New Zealand, Lower Hutt Mayor John Terris was of a like mind to President Bush, though he put it more bluntly. The 17 March Ashburton Guardian reported: “…Terris stands on the other side of the fence and has declared the UN “a bunch of useless wallies”.The next day, Tuesday, 18 March, Parliament debated, for the first and only time, the merits of the Government’s position. National’s Bill English then spoke, echoing President Bush’s statement two days previous: “The National Party will be supporting a coalition of the willing. We believe that it is in the interests of global peace and the long-term interests of New Zealand to see Saddam decisively disarmed”. Winston Peters, of NZ First, complained bitterly about the ‘high-handed tactics’ of the Prime Minister and asked why it had taken until the very last days before war for Parliament to have the opportunity to debate this critical issue. He then lined up with the Government: “[W]hat we cannot support, and we have made it clear from day one, is a unilateral decision by one group of countries to invade another, for the terrible precedent that it might set. Richard Prebble, of ACT, then sought leave for a motion of support for the war: that “…this House disassociates itself from the New Zealand Government’s position at the United Nations…and calls on the New Zealand Government to offer all practical support to the “coalition of the willing”. The motion was supported by National and ACT. Labour, NZ First, the Green Party, United Future and the Progressive Party joined to defeat the motion, 84 to 35. 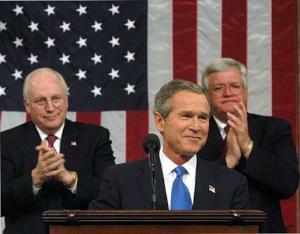 Ten years ago, on Thursday, 20 March 2003, “Operation Iraqi Freedom” began. The dismal statistics are well-known: in the coming years the war would, by conservative estimates, kill over 100,000 Iraqi civilians (and over 4400 American soldiers) and create over 2,000,000 Iraqi refugees. 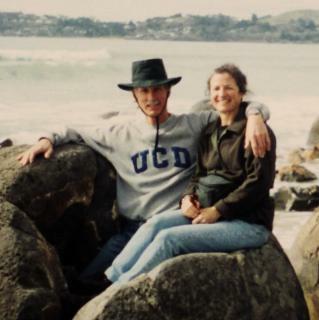 Footnote : Louise and I settled in New Zealand nine months after the invasion, in January 2004. We chose to shift to New Zealand primarily because of New Zealand’s honourable and remarkable refusal to join “Operation Enduring Freedom”. Part of the draw, as well, was a beautiful country with a small and friendly English-speaking population. The war divided our families. Ten years later we are on good terms with all of our US friends and with most of our relatives. However, a few of our nearest and dearest, even some who opposed the war, have never come to terms with our decision to leave. There is anger that may never be resolved. We have had dual citizenship since July 2007. Though our primary focus is here, we still watch the US headlines. Living outside of the US has highlighted for us the impact that decisions made there have on the rest of the world. Thus, we’re aware of the privilege and feel the responsibility of voting in US national elections perhaps even more keenly than before. We continue to pay US federal income taxes. We miss our good friends and loved ones in the States, and visit them when we can. We have no plans to return permanently. New Zealand is now our home.